We’ve all heard the phrase “make do and mend” and most of us probably know it originated in wartime Britain. Clothes were actually rationed in Britain from 1st June 1941 as fabric had become essential for war purposes. During this time around a quarter of British people were entitled to wear a uniform, which was a large burden on resources. Added to that, factories and workers were needed for other war-related purposes and so civilian clothing production needed to be greatly reduced. Clothing coupons were made available in much the same way as food coupons. 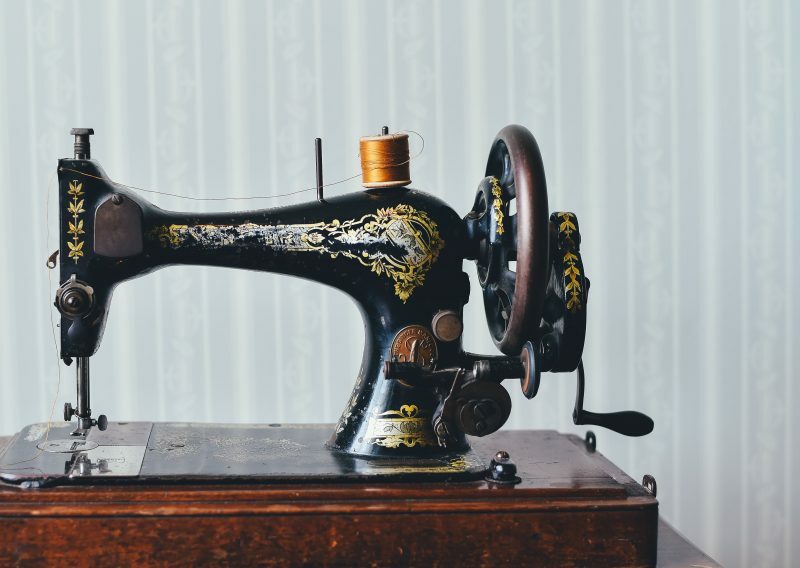 The cost of clothing did not reduce, but each item was given a coupon value based on the amount of fabric and skill involved in its production. Handmade and repaired clothing became essential so that people could make the most of their coupons. 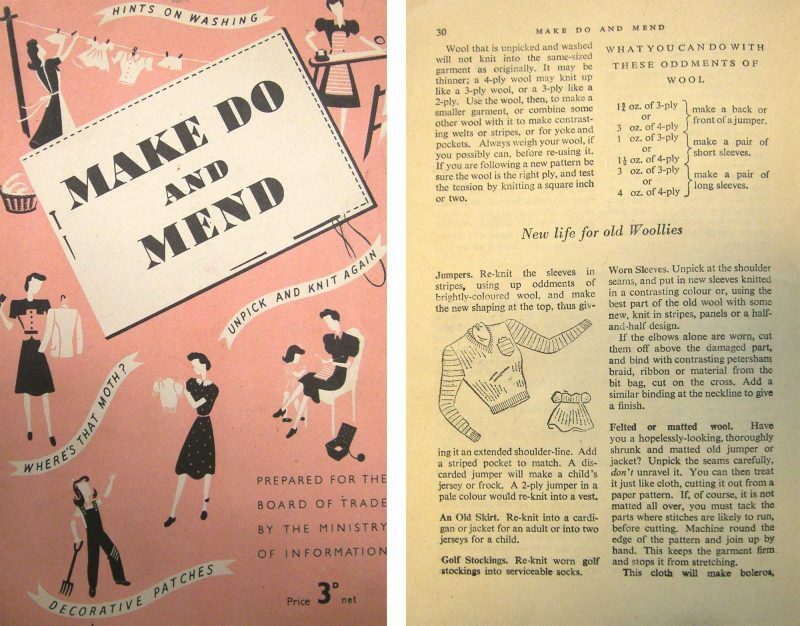 The Board of Trade officially supported the Make Do and Mend scheme from the autumn of 1942. The aim of the scheme was to encourage everyone to make their clothes last longer, rather than replacing them. Everyone was encouraged to improve their sewing skills, particularly women. Although sewing ones own clothes was encouraged, fabric had also been rationed. This ultimately encouraged some creativity as other sources of fabric were utilised: old blankets, blackout curtains, men’s suits, other items of clothing past repair and even escape maps printed onto silk! Darning became an essential skill, as everything that could be repaired was. Darning thread was made freely available to make repairing accessible to everyone. Knitting also became very popular and even undergarments were hand knitted. However, even wool was rationed unless it was under 16% animal hair. As well as making and mending, swapping clothes was encouraged. The Women’s Voluntary Service set up clothing exchanges specifically for children’s clothes. Here in 2017, it’s unimaginable for the government to have such sway on our personal lives. I can’t imagine our fast fashion-obsessed society welcoming such draconian measures. Most people would readily admit that they wouldn’t have the skills to live a make do and mend way of life. How many people do you know that can’t sew on a button? Over the decades sewing skills really have been lost. I started to sew about 5 years ago, but I’ll readily admit that before that I would get rid of clothes if they’d even lost a button. I had no clue how to repair anything and, embarrassingly, I didn’t see the point as clothes can be so cheap. Once, I had a beautiful wool winter coat that I loved wearing for playground duty. Why did I chuck it out? The lining had torn. I didn’t have the knowledge to repair it so I got rid of it. Serious regret. Even now that I do sew, repairs have tended to stay near the bottom of my list. Since I’ve been looking into sewing more sustainably I’ve realised that repairing is a large part of that. Whether repairing handmade clothing or ready to wear, it’s got to be better to repair clothes rather than recycle them. Now that I am looking at my clothes in a different way, I’m wondering what has taken me so long to come around to repairing. Next Post Blästa Henriët wheatbag: The perfect ethical Christmas present? I know some WWII soldiers sent their used parachutes home to their fiances who would then make their wedding dress out of the material. we did a repair day for fashion revolution day this year – as I think bringing and doing repairs in a group is more interesting as sometimes it can be boring – although personally I find after a while it is very rewarding, for often very little effort. the other reason we did it was so people could bring stuff in for advice on repairs……and anyone I ever teach sewing to – I suggest they pay themselves a tenner each time they repair a zip! I love the idea of making repairing a more sociable activity, you’re right that it can be seen as a bit dull. Plus there can also be a be of skill swapping too! I had no idea clothes were rationed before I started looking into it!